Not everyone is on my side with this, but I LOVE chilly autumn nights. Give me fall over summer ANY. DAY. OF. THE. WEEK. I love sitting outside under a warm blanket, watching the kids play and chatting with Hubby. I prefer to enjoy these nights with a warm mug in my hand, and I've come up with the perfect hot beverage to fill that mug with. 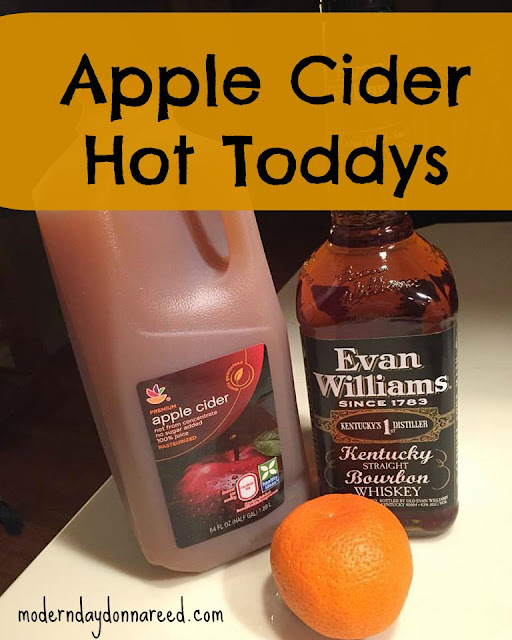 It combines the awesomeness that is whiskey with apple cider and a few flavor boosters for, what I like to call, PERFECTION. It's a simple recipe that only calls for 4 ingredients. Simmer it on the stove and pour yourself a mug after the kiddos head to bed! - Simmer all ingredients on the stove until warmed through. - If you're artsy, garnish with a little bit of orange peel, because it's fun to make drinks pretty.